The Competition Clutch Domestic Stage 1 – 2200 Brass Plus Clutch Kit is designed for the moderate enthusiast for those who require a unit superior to stock replacement. This kit will deliver a 20-40% increase in torque capacity. 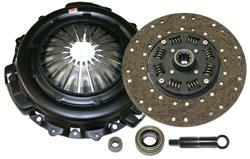 This unit uses the Competition Clutch Brass Plus with Steel Back Facings. We have found through extensive research and development that this material clearly leads the industry in coefficient of friction, burst strength, and heat dissipation. These facings are riveted to an exclusive Competition Clutch extreme torque dampened performance disc that incorporates eight heavy duty springs with reinforced retainer rivets.